As a trumpet soloist, Mary Elizabeth Bowden has been called “an exquisite player whose polished tone is heard in ample supply.” Now, she’s partnered with the Pittsburgh-based Kassia Ensemble to present outstanding new arrangements and compositions for trumpet, strings and harp. The group’s debut recording will be released in April and features works by female composers Sarah Kirkland Snider, Catherine McMichael and Germaine Tailleferre. One of the group’s first performances together will be held in Erie. On Wednesday, April 10, the ensemble will perform at Penn State Behrend as part of Music at Noon: The Logan Series. Their concert takes place at noon in McGarvey Commons, in the college’s Reed Union Building. Admission is free, and reserved parking for audience members will be available in the Reed lot. Comprised exclusively of women, the Kassia Ensemble’s members hold positions in the Pittsburgh Opera and Ballet orchestras, the West Virginia Symphony, the Wheeling Symphony and the Canton Symphony Orchestras. 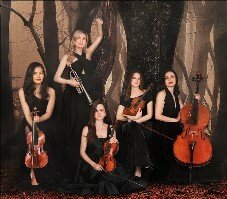 The group works to overcome the gender barrier that is prevalent in classical music. “Rêverie,” the group’s collaborative album with Bowden, will be released in April and can be pre-ordered at marybowden.com. Music at Noon: The Logan Series was founded by Mrs. Kay Logan in 1989 and receives major support from the Kay Logan Trust. Additional funding is provided by the Penn State Behrend Student Activity Fee. Music at Noon receives state arts funding support through a grant from the Pennsylvania Council on the Arts, a state agency funded by the Commonwealth of Pennsylvania, and the National Endowment for the Arts, a federal agency. Additional support for this program is provided in part from an Erie Arts & Culture Project Grant, made possible by community contributions to the Combined Arts & Cultural Campaign and the Erie Arts Endowment. For more information about The Logan Series or the Kassia Ensemble and Bowden’s appearance, contact series director Gary Viebranz at 814-898-6289 or email gav3@psu.edu.